My students always seem to struggle with the concept what number comes before, after, or between. To help combat this issue, I'm creating these centers to allow students the opportunity to practice. 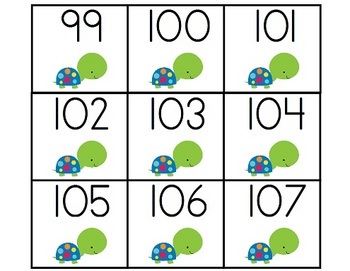 This set is covers numbers that come BETWEEN numbers 0-110. Inside each folder you will find 2 PDFs: one including the workmats, directions, and number cards the other one contains 2 worksheets you may wish to use along with each center. One worksheet requires the students write in the missing numbers that come between. 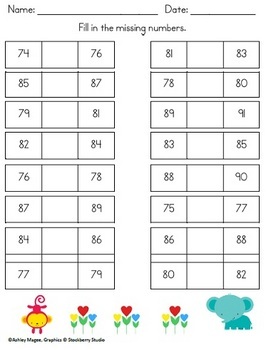 The second worksheet requires they cut out the numbers and glue them in the correct box. The boxes they cut out are rather small (probably too small for Pre-K and K students). My first graders always need work on cutting out smaller things which is why the boxes are rather small. Each different set of workmats has a different colored border so you can easily tell which workmats belong with which sets should they become mixed up. 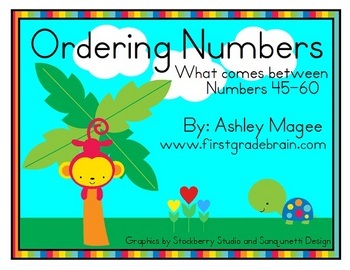 In fact, you may want to mix them up anyway to challege your students to work with a larger range of numbers. 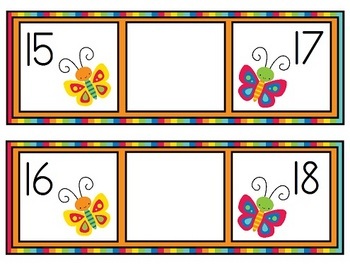 Each set of numbers and workmats features a different combination of rainforest animal graphics as well.